Holbæk is a city in Zealand. Holbæk is the seat of Holbæk Municipality and the second largest city of West Zealand Region with 26,000 inhabitants. The city is situated by Holbæk Inlet, which in turn is connected to the larger Ise Inlet. Holbæk is an important harbour city and a commercial and cultural center for the area. 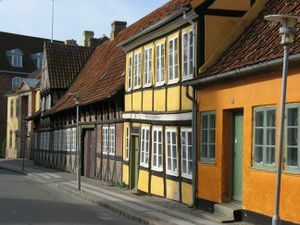 Holbæk's history dates back to around 1200. The city expanded from around 1300 when the king built a castle here. However, the city has historically not been as important as other major cities in the area and only little from the city's early history has survived until today. Holbæk is a major stop on the Copenhagen-Kalundborg railway line  running nearly in a straight line west over Zealand with departures once or twice per hour during most of the day. 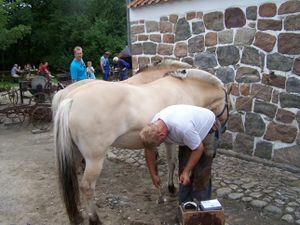 It takes around 50 minutes from Copenhagen and Kalundborg, and around 30 minutes from Roskilde. Holbæk station is the interchange to the private Regionstog's  line to Nykøbing Sjælland, which covers nearly all of the Odsherred Peninsular. If you are comming from West Denmark change to bus 13 in Slagelse (Intercity trains), it takes around an hour, the bus continues to Nykøbing Sjælland and gets there a bit faster than the train. Another option is catching the ferry  to Kalundborg from Aarhus and catch a train from there. Most of the Abildskou  intercity buses between Copenhagen and Jutland stops at the Q8 gas station in Tuse (Kalundborgvej 220). There are ten city busses all running from Holbæk Railway Station, most of them running once an hour but a few of them running two or three times every hour. For taxis call +45 5943 4343. This page was last edited on 20 November 2013, at 12:42.